For Mother's Day I made this old piece of wooden gate, found in a pile of wood to be burnt or used for kindling. It was made with natural greenery I preserved in a Glycerin bath and added flowers and decorations. I love to make unique and new ideas with my crafting skills I keep improving as I create more items to put into my shop. This is a work in progress making my new website and adjusted it everyday. Take these and out into the solution. I can't promise this will preserve them. I only tried it out and so far it's been working but with some little bit I notice that might not last as long as I had hoped. 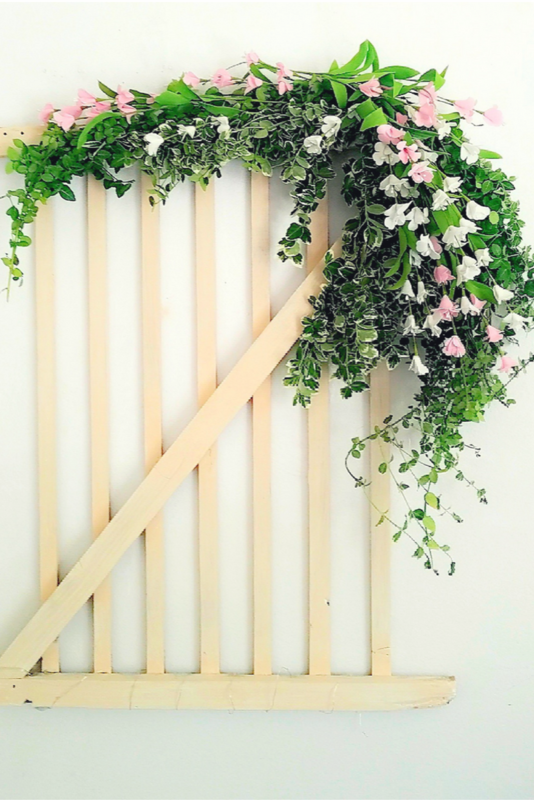 After you trim your bushes you can use them for decorating fresh flowery wall art, outdoors art, or any kind of door sway or wreath. ( Please note that this might not work but only for boxwood.) Take a bucket or fill a tub with 1 part hot water and 2 parts Glycerin and stick the stems in it first then wrap around the rest of the branched. I soaked mine for over 2 hours to make sure they got all the way soaked from the stems to the ends Reason for this is because the water would be gone after a while. Ir soaked it all up. So I suggest keep on adding more as you wait 1 to 2 hours. This website receives a small commission from it's advertisers please read my disclaimer policy. Get a photo album made or make an e-book.